Bacon-Honey Peanut Butter. That is one ingredient. Let that sink in for a second. Bacon. Honey. Peanut. Butter. While combining this with bananas on a sandwich was one of Elvis' favorites, we encountered this wonderful combination as a burger topping on this beautiful burger blog. The sweet and smoky combination provided a nice contrast to the umami of the burger/cheese and the tang of the Budweiser sourdough hamburger buns. Even though peanut butter on a burger seemed crazy at first, after tasting I realized this was a combination I could get behind. The flavors balance really nicely. Enjoy ferociously but sparingly. 1. Form ground beef into patty. Make center of patty thinner than edges because middle tends to puff up. 2. Preheat grill on high for at least 10 minutes, lid closed. 3. Grill beef (open lid) for 3-4 minutes on each side for the lower end of medium rare. Longer if you like it overdone. 4. Top with cheese and close lid for a minute to melt. 5. Combine last five ingredients. Microwave for 15 seconds to soften peanut butter and mix to incorporate well. 6. 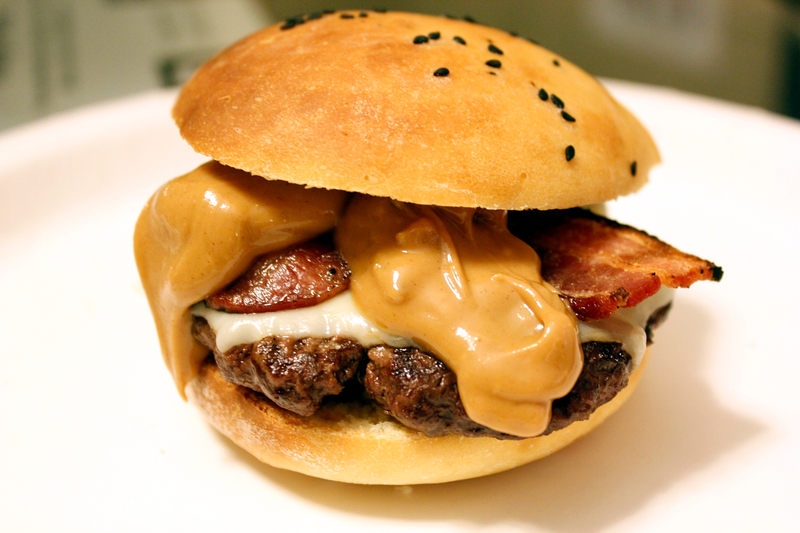 Place burger on split bun (toast if desired), top with bacon and peanut butter sauce, enjoy.